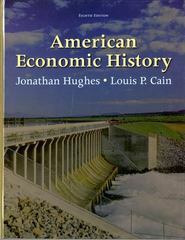 American Economic History 8 Edition America’s present economy, understood through its past. Rich in both quantitative techniques and economic theory, American Economic History demonstrates how an understanding of our past can illuminate economic issues that face society today and in the future. In simple, elegant language, this text walks readers through four centuries of political, social, and economic history, focusing on laws and institutions and emphasizing current economic topics. The eighth edition has been updated and revised, and includes expanded discussions on population, health, and labor; education; the automobile industry; income and taxes; social security; unemployment; regulation and the financial industry; and the history of economic recessions.